Apoyemos al Español is a 501 (c)(3) non-profit organization compiled of parent volunteers that supports the K-12 Spanish Immersion Program in the Lincoln cluster schools in Portland, Oregon by facilitating fundraising activities, approving and distributing grants to its three schools, coordinating the 8th grade capstone trip, and coordinating and overseeing the intern program. Apoyar is a verb that means to support, to aid, to back, to hold up, to stand by. Pronounced "A-po-yea-mos", the name of the organization means we support, aid, back, hold up and stand by Spanish: the language, the culture and the Spanish Immersion program. Supporting Students and Teachers. Creating Cultural Awareness and Global Thinkers. Incorporated in 2003 by families of the 2008 Lincoln graduating class, Apoyemos el Español was initially founded to ensure that fundraising done in connection with the Spanish Immersion 8th grade educational trip to Costa Rica could be done through a non-profit corporation. 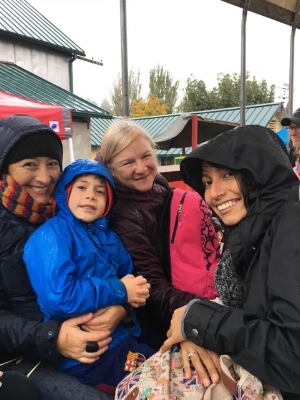 The parents had a vision that Apoyemos el Español could eventually become an umbrella organization, supporting the teachers and students in the immersion program at Ainsworth, West Sylvan, and Lincoln schools in Portland. True to the original mission, and now in our fourteenth year, a group of volunteer board members work together to support the program. Through fundraising efforts, Apoyemos helps bridge the gap between what public funding is able to provide, and the excellent education we all want for our children. Apoyemos supports students, teachers and staff by facilitating and managing a native Spanish speaking intern program at all three schools, providing grants to teachers for learning and teaching resources, and subsidizing the cost of and providing needs-based scholarships for the 8th grade service and educational trip to Costa Rica. What do Apoyemos Funds Support? For six years, Apoyemos has enabled native Spanish speaking interns to bring teaching experience, culture and support to Spanish Immersion classrooms at Ainsworth, West Sylvan and Lincoln. Sign up with your email address and stay up to date on Apoyemos events.